With the dawn of digital technology, digital music has superseded other forms of media channels such as radios which have gradually become out dated if not obsolete. However, radios actually remain relevant and expedient not only as a source of entertainment but of news and information especially during times when the internet is not available. This is especially true during state of calamities when most internet service providers are down and the only signal we can get are radio signals. 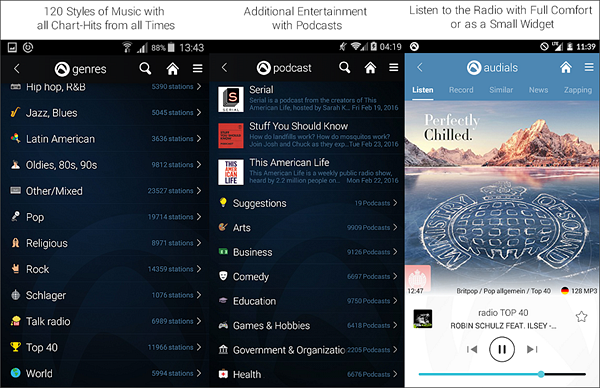 Hereunder are the 9 best free radio apps for Android. This app is developed by TuneIn Inc., a US-based audio streaming service that brings live news, music, sports, and radio from around the globe. It allows you to listen to audio streams from over 100,000 radio networks and stations across the world. But since listening to music can practically be provided by other music player, this app specializes in providing a live reporting stream of practically all of your favourite sports and teams. Whether you are an NFL, College Football, and major Major League or World Series game fan, you can tune in at TuneIn and get to enjoy a live stream report of the game as they happen. Aside from sports, you also stream practically all the major new media channels such as CNN, BBC, NPR, Fox and MSNBC. In this way, you get updated of the latest news around the world in real time. This makes it the best radio app for Android. This radio player app is owned a US based mass media Company called iHeartMedia. It was developed in 2008 designed to collect all radio content from across the US via a single internet radio platform. Downloading this app would allow you to hear every single radio station all over the US, which makes it one of the best Android radio apps. 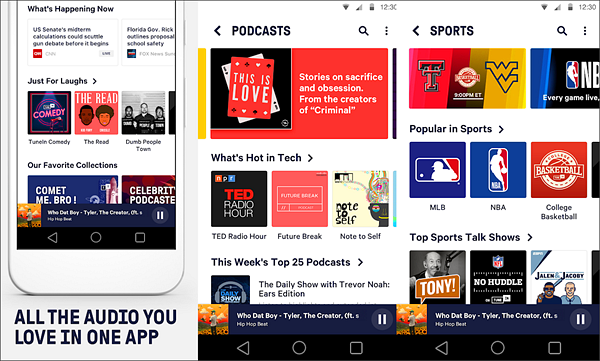 Aside from the customary listening for news, sports, comedy, talkshow and podcasts, one major feature of this app is the ability to create your own free personalized station that would feature all your favorite songs. 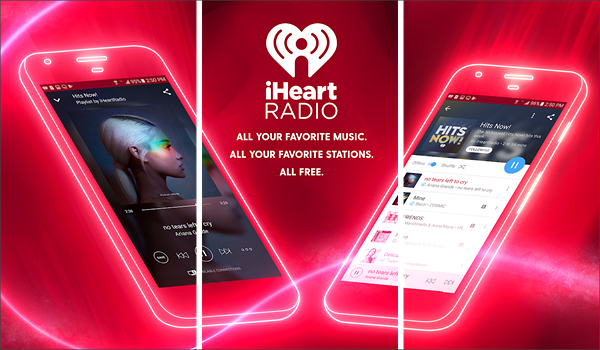 And the premium features of either the iHeartRadio Plus or iHeartRadio All Access can allow you save music from the radio so that you can listen to your favorite tunes offline. Pandora music is a radio app that also functions as a music player which can provide on demand listening. This makes it one of the best free radio apps for Android. 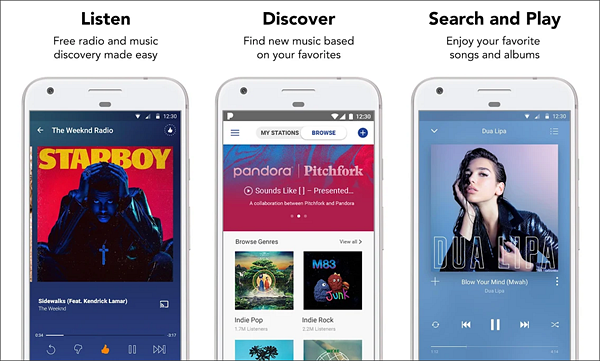 Aside from the customary radio functions of providing as the all in one channel to access different radio stations and networks around the world, Pandora also allows you to search play any song of your choice and creates a playlist of your favorite music. Like iHeartRadio, it allows you to download music for offline listening. And as one of the best Android radio apps, you get to listen to music with high quality audio, which is rather exceptional for a radio. This is an online radio app for Android that broadcasts hundreds of radio stations across different music genres from jazz, rock, pop, retro, disco, chill out music, among others. What sets Radio Online – PCRADIO apart from other radio apps for Android is it allows you to listen to music and radio in high quality audio even with minimal internet speed. With at least 24 Kbit/sec of connection, you can operate the radio and enjoy music and news. 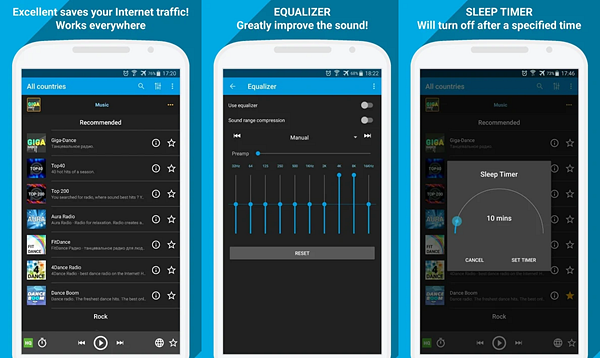 This Android radio app is ideal for people with low speed connection or people who live in places with low internet signals. Finally, this is battery competent and can be regulated from your earpiece or headphones. Radio FM which stands for Radio For Mobile, is one of the best free radio apps for Android because it was designed to integrate well with other Android devices such as Android Auto, Google Chrome cast, Android watches. As an internet radio station, it offers access to over 30,000 radio networks from the world including news, podcasts, talk shows, various programs and music from all kinds of genres. As a radio player, it provides authentic radio experience to users for free, including setting sleep timers and alarm clocks on that will automatically tune you in your favorite radio program. It follows a Google recommended design features which accounts for its simple user interface for easy navigation and use. Fast search and access is the key to ease of use hence you can quickly access radio by country, by your preference, by your recent activity, which you can create shortcuts in your home screen. And because it values user input, it allows you to suggest a station in a specific area where you want to tune in. 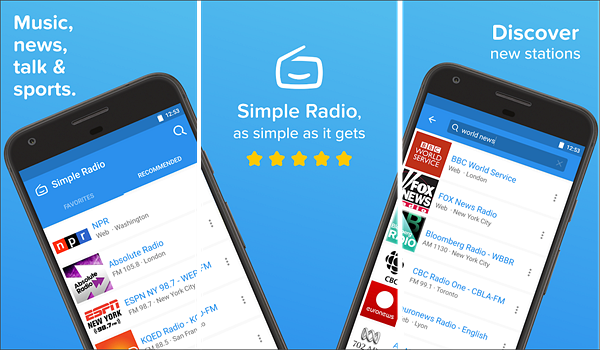 This free radio app for Android by Streema truly lives up to its name for providing the most optimal way to access radio in your phone. The app basically has only three screens. The first screen is the search facility where you can enter music genre, station, city, country or anything associated with what you are looking for. 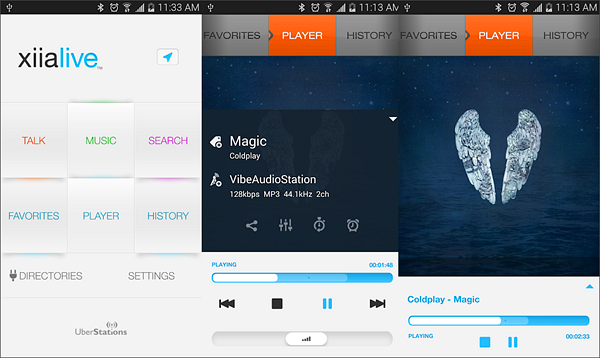 The next screen provides you with a list of radio stations that match your search. Once you select the station of your choice, it leads you to the third screen which plays the station. And that’s about it. Once your station plays, you can opt to add the current station in your favorite list and turn the sleep timer on. myTuner Radio App was created with a single mission: To allow you to enjoy the best radio stations around world anytime and anywhere. It offers over 50 thousand radio stations to choose from and if you still can’t find one that you like, you can suggest your preferred station it will provide it. And to truly enjoy its services, you can use app not only in your phone but in your desktop, laptop, smart TV, apple TV and other similar devices. You can connect the app in your car players through in control apps and Android watches. myTuner is integrated to the widest range of devices and paraphernalia so that you can enjoy the best radios in the most convenient and preferable way. As one of the best radio apps for Android, XiiaLive™ – Internet Radio was originally developed using Fmpeg, which utilizes open source code to empower the app to support practically all audio formats in the world, making it the best stream engine. 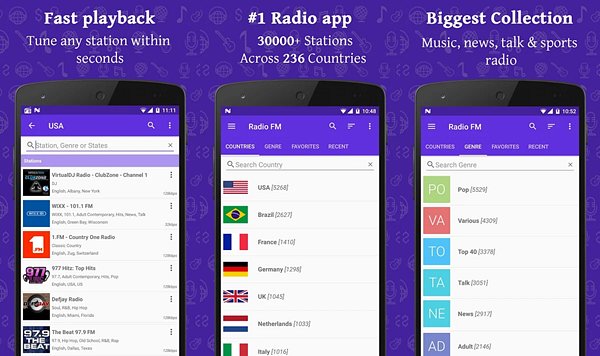 As an Android radio app, it offers over 50,000 live radio stations from around the globe for free. What brought in the list of the best free radio apps for Android is its special user features including adding your own URL link, smart recovery to prevent interruptions; HTTP Authentication support; advance filtering options, Wi-Fi /Hotspot auto connect, network data plan guard; and advance Bluetooth controls among others. 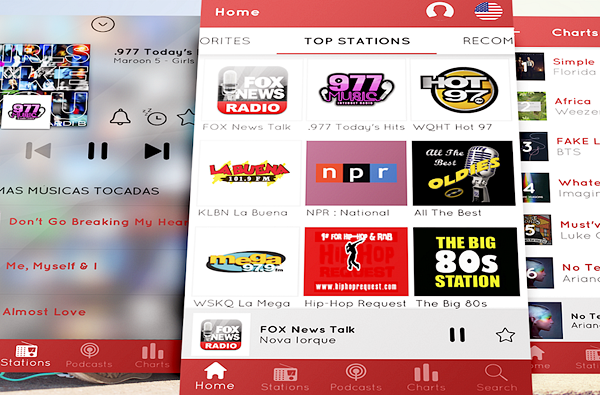 This app is touted as the ideal all-in-one radio app for Android. Aside from offering over a hundred thousand radios and over 260,000 podcasts, what sets this app above from other radio apps is its ability to record entire broadcasts which you can listen later when you are offline. It also comes with the traditional features of radio players such as clock radio, sleep timer, equalizer cloud management for recording and accessing your on demand. All the aforementioned radio apps for Android provide the basic advantages of internet radio including extensive choice and variety, less advertisement compared to the typical radio, and better sound quality caused by poor radio frequency and other environmental interference. However, all these apps depend ultimately on your cellular data connection to operate. Hence, you need to have an internet to play and enjoy these radio apps. The Google Play Store has collected many great apps for Android users. But outside of this platform, there are also many very great tools and software to recommend, one of which is iReapro for Android. 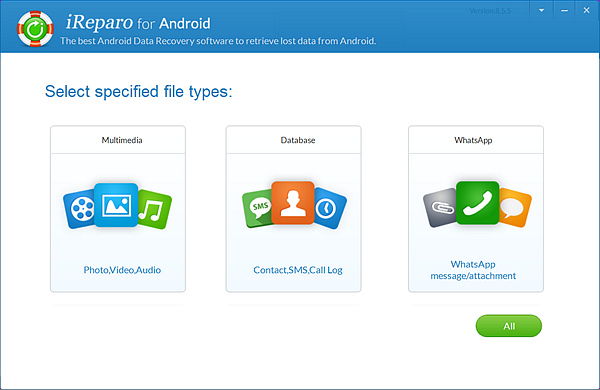 This is a very useful software to help Android users recover lost or deleted data in the phone, including contacts, messages, call logs, chats, pictures, videos, music, etc. If you encounter data loss one day, it will be your best personal assistant.